Lokomotiv’s unstoppable attack, Traktor’s path to the silver medal, and the best finals in the KHL history. These series was the last with the participation of the team that six months later tragically fell victim to the plane crash near the Tunoshna Airport. The top scorer of the series against Dinamo Riga was Alexander Galimov, with seven points. The 2011 Gagarin Cup rush was for the Railwaymen a demonstration of their immense offensive potential. At each stage, Lokomotiv had memorable games, including the scoring race against the Latvian team. The series between Lokomotiv and Dinamo Riga still holds the record as the second-round playoffs series with most goals scored. The team lead by Vladimir Vujtek lost only once, but even in that case the game was a real goals festival: in Yaroslavl, Lokomotiv was up 3:2, but managed to allow three goals in the third period. However, the craziest game was the first one in Riga, where the two teams rained the goals. The game’s real surprise was Daniel Tjarnqvist: he had a total of three goals in the whole regular season, yet in that game, he stole the scene with a hat-trick. After piling up eight goals, Lokomotiv players limited themselves to six in the next game, and the path to the next round was completed with a more modest victory with a 5:4 score. 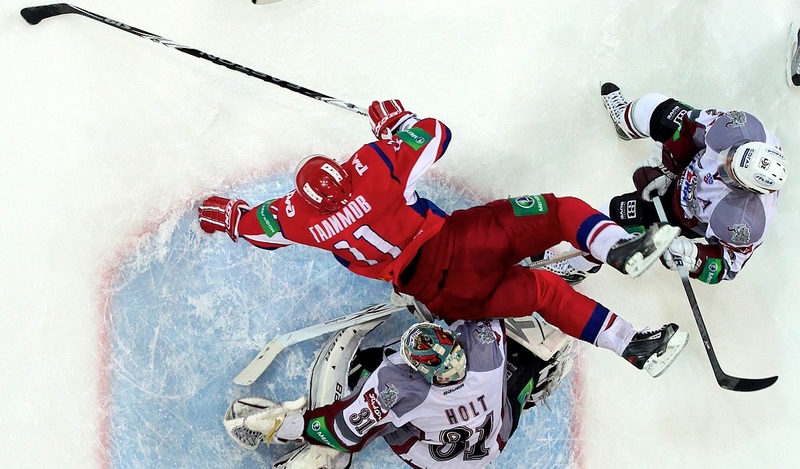 The late Alexander Kalyanin gifted Lokomotiv the ticket to the Western Conference finals. 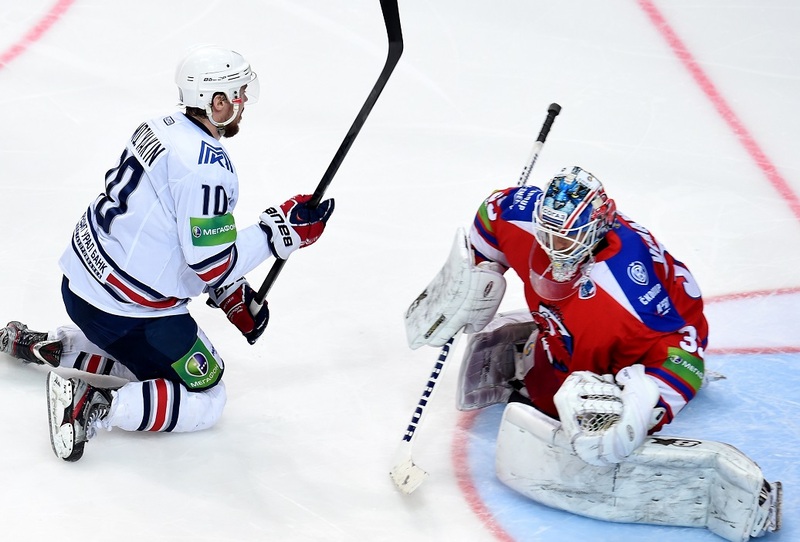 If asked about the best KHL finals in the League’s history, in spite of the difficulty in picking one edition many would call for the clash between Metallurg and HC Lev. Firstly, those finals were a real epochal event. For the first time in history, a non-Russian team made it to the finals. For the first time in history, a non-Russian coach lifted the Cup. In any case, the battle of the Urals teams and Czech international turned out to be truly exciting. The teams needed seven games to determine a winner. Oddly enough, in the fifth game of the series, the teams decided to take a pause on goals and the score was just 1:1 after regulation. And who is surprised to read that Sergei Mozyakin scored the game winner? It all started when the Prague beast stormed the Magnitogorsk den. The 0:3 in the first game on the Urals woke up Magnitka’s leaders, who scored three of the four goals their team scored on Petri Vehanen. But the real madness happened in Prague in the sixth game: the Steelers were up three different times, and it looked like they had the Gagarin Cup in their pocket. However, Mikko Maenpaa didn’t agree and tied the game up with only two minutes and a half to the final horn. In overtime, Nathan Oystrick scored not only to gift us a much-anticipated game seven but also caused Mike Keenan to go ballistic. The last game of the series was the game with most goals, with 11, but more than half of them were scored by Metallurg. No other final series saw hockey played in such offensive way. Do you remember when we said that Lokomotiv was Rock’n’Roll during the 2011 Gagarin Cup playoffs? A single series from one season would be not enough for such a claim. Moreover, the victim of the Railwaymen assaults was another Dinamo, this time from Minsk. The Belarusians, however, lasted much more than their Latvian counterpart. The series wasn’t only a duel between Czech coaches (then, Marek Sykora guided Dinamo Minsk’s bench), but also between Czech and Slovak leaders of the teams. Lokomotiv’s top-scoring list was led by Jozef Vasicek (4+7) and Pavol Demitra (1+9), while Dinamo Minsk’s lineup featured the productive blueliner Peter Podhradsky (2+6). The first goal of the series was a shorthanded marker by Ivan Tkachenko. The Kalyanin – Churilov – Galimov line scored other three goals as Lokomotiv won 7:4. However, in the next game, they could score only with a Pavol Demitra shootout and with two 4-1 wins, Dinamo Minsk went ahead in the series. At this point, Lokomotiv had another burst, helped by Kalyanin’s double. Yaroslavl may clinch the series in Minsk, but when they were down by one goal, they couldn’t tie things up and allowed the fifth goal. But at home in a packed Arena 2000, Vujtek’s troops didn’t leave the Bisons a single chance. The Railwaymen scored six times as only Geoff Platt made it to the scoresheet for Dinamo. This series is less than one year old and is still fresh in our memories. Both teams didn’t get to the playoffs in their best shape: Salavat Yulaev fired its GM midway through the season, while Avangard decided for a coaching change. From a conservative team flowing along the rails set by head coach Andrei Skabelka, the Hawks turned into a worthy competitor to Salavat in attacking power. Since his coaching debut in Novokuznetsk, German Titov declared commitment to Soviet hockey. However, he didn’t always succeed in shifting his views onto the ice surface, but the Olympic break helped. While the Russian national team took gold in Pyeongchang, Titov instilled in Avangard a forward-first mentality. The meeting of these twin teams in the first round resulted in an incredible performance. In the first three games, they scored a total of 27 goals – a decent result even for a full series. After a 6:4 in Ufa, the Hawks replied with a shocking 7:2 win the next day, with a hat-trick by the always-dangerous Andre Petersson. The offensive inspiration was enough for another game in Omsk, but after the 5:3 win by Avangard, the series went into a more reasonable direction. Erkka Westerlund and German Titov turned the settings, partly by changing tactics, but the outcome was still unforgettable. 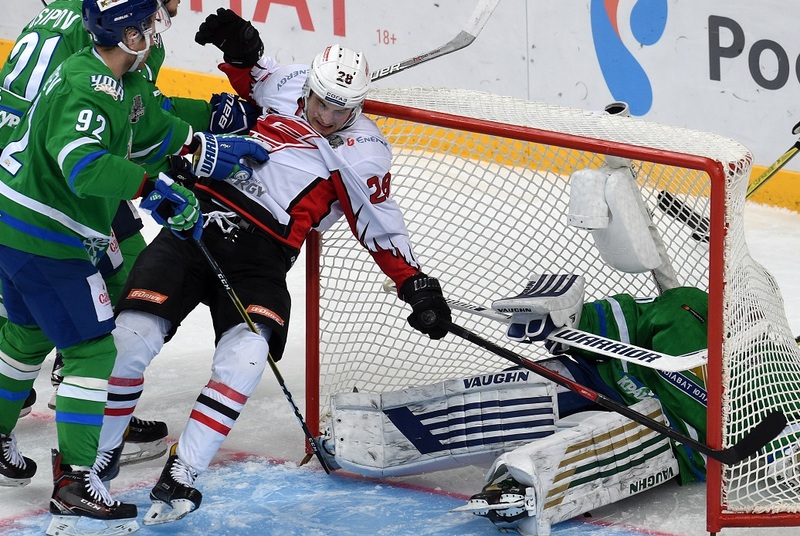 In the seventh match, Maxim Chudinov turned the game into overtime 17 seconds before the horn, and in overtime, the former Avangard defenseman Maxim Goncharov scored his first and only goal in last year’s Gagarin Cup playoffs. To date, the playoffs series with the most goals in the Gagarin Cup history is the first-round clash between Traktor and Barys in the 2012/2013 first round. That year, the team led by Valery Belousov reached the Gagarin Cup finals, where they lost to Dynamo Moscow. However, Traktor risked an early exit that year, having lost the first two games in the first round, and none-the-less at home! As the team had to learn, scoring three goals a night isn’t enough when you have to face Barys’ North American top line. In the first game, Brandon Bochenski had a double, while in the second game Nigel Dawes scored four times; the third loss in a row would mostly mean forced holidays for Traktor, but in Astana, everything turned upside down. In the Kazakhstani capital, Traktor managed to stop the line made up by Bochenski, Boyd, and Dawes. In the next two games, they accumulated only one goal. For Traktor, the bottom lines clicked as Yegor Dugin and Maxim Karpov found their best touch. The sixth game in the series was the game with the most goals scored as Traktor won 6:3, while in the seventh one, the team led by Belousov scored one goal less. The Ural team played a very enjoyable game, as the late Valery Belousov always preached. Moreover, that clash kick-started the career of the then-17-years-old Valery Nichushkin, who scored his first goal against Barys. At that time, the Chelyabinsk-born forward had already made some noise at the WJC in Ufa, and after the end of the playoffs he moved to Sochi for the U18 WJC.